On every Windows system able to create system restore points that undo any configuration changes made after their creation, there is also the possibility to create simple quick-link icons, consisting of a few line of code, that enable you to create restore points with a double-click. On Windows XP this is achieved with only two lines of code. Learn in this post, how it is done. In Windows Vista and 7 however, there are a few problems that stand in the way of our (automatic) one-click system restore point. 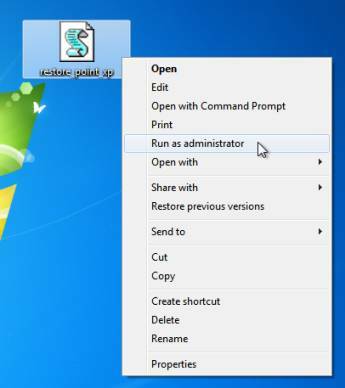 First one is, that the script we need to run to create system restore points can only be run with administrative powers, so we need a way to get those. Second is the annoying User Account Control that asks as if we really want to run that script. This would not be such a great deal, but if you are the kind to create restoration points quite often or after a time schedule, the UAC may become a great pain. Save the file and double-click to merge it with the registry. The Open as administrator option should now be available to all Visual Basic Scripts (you can use the one from the linked XP tutorial with this option enabled). Save the script as *.vbs and make sure to select All files from the dropdown menu before saving! With this, you have enabled administrative rights beforehand every time you run the script. Now there still is a slightly circumstantial method to also disable the UAC prompt. 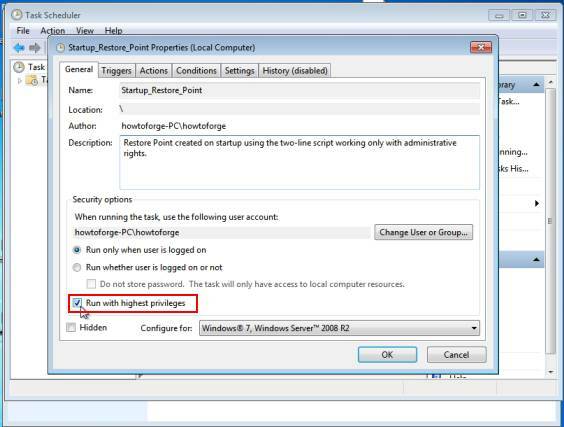 To achieve this, you need to have a desktop shortcut pointing to a scheduled task that runs the script with highest privileges grantable. To access scheduled tasks, browse Menu > Control Panel > System > Administrative Tools > Scheduled Tasks. Create a new one without any trigger, executing your script (be sure to remember the task's name, you will need it once more) and check the Run with highest privileges box on the first tab. Upon opening, it should execute the script without asking for anything.